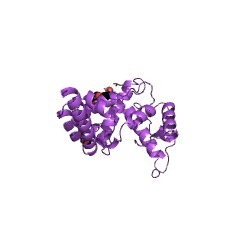 Domain named after the S. cerevisiae SEC7 gene product, which is required for proper protein transport through the Golgi. 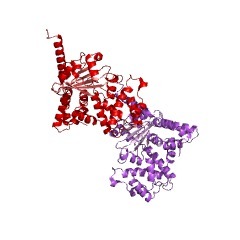 The domain facilitates guanine nucleotide exchange on the small GTPases, ARFs (ADP ribosylation factors). 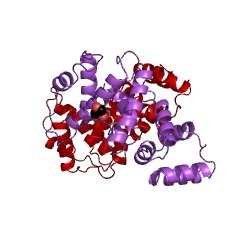 Protein containing this domain are highly divergent in their overall sequence, however, they share a common region of roughly 200 amino acids known as the SEC7 domain. 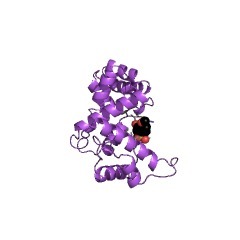 The 3D structure of the domain displays several alpha-helices [(PUBMED:9653114)]. 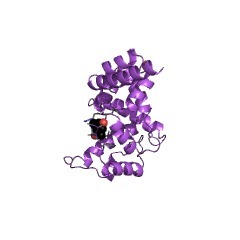 It was found to be associated with other domains involved in guanine nucleotide exchange (e.g., CDC25, Dbl) in mammalian guanine-nucleotide-exchange factors [(PUBMED:9868368)]. 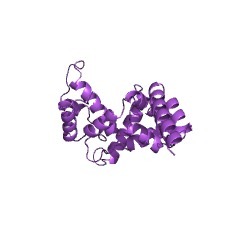 SEC7 domain containing proteins are guanine nucleotide exchange factors (GEFs) specific for the ADP-rybosylation factors (ARF), a Ras-like GTPases which is important for vesicular protein trafficking. 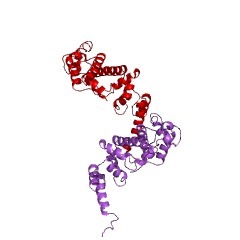 These proteins can be divided into five families, based on domain organisation and conservation of primary amino acid sequence: GBF/BIG, cytohesins,eFA6, BRAGs, and F-box [(PUBMED:24728583)]. They are found in all eukaryotes, and are involved in membrane remodeling processes throughout the cell [(PUBMED:19669794)]. 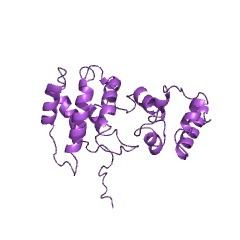 There are 12422 Sec7 domains in 12390 proteins in SMART's nrdb database. Taxonomic distribution of proteins containing Sec7 domain. This tree includes only several representative species. 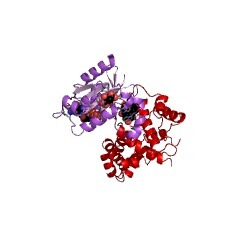 The complete taxonomic breakdown of all proteins with Sec7 domain is also avaliable. 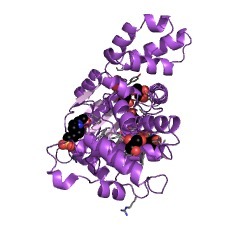 Click on the protein counts, or double click on taxonomic names to display all proteins containing Sec7 domain in the selected taxonomic class. A glutamic finger in the guanine nucleotide exchange factor ARNO displaces Mg2+ and the beta-phosphate to destabilize GDP on ARF1. 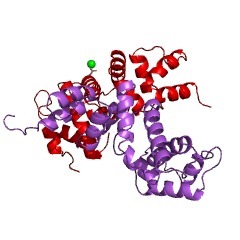 The Sec7 domain of the guanine nucleotide exchange factor ARNO (ARNO-Sec7) is responsible for the exchange activity on the small GTP-binding protein ARF1. 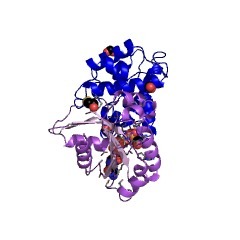 ARNO-Sec7 forms a stable complex with the nucleotide-free form of [Delta17]ARF1, a soluble truncated form of ARF1. 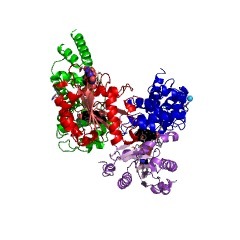 The crystal structure of ARNO-Sec7 has been solved recently, and a site-directed mutagenesis approach identified a hydrophobic groove and an adjacent hydrophilic loop as the ARF1-binding site. 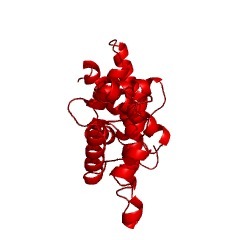 We show that Glu156 in the hydrophilic loop of ARNO-Sec7 is involved in the destabilization of Mg2+ and GDP from ARF1. The conservative mutation E156D and the charge reversal mutation E156K reduce the exchange activity of ARNO-Sec7 by several orders of magnitude. 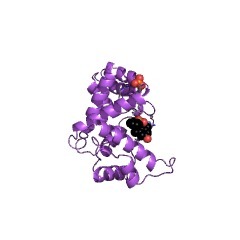 Moreover, [E156K]ARNO-Sec7 forms a complex with the Mg2+-free form of [Delta17]ARF1-GDP without inducing the release of GDP. Other mutations in ARNO-Sec7 and in [Delta17]ARF1 suggest that prominent hydrophobic residues of the switch I region of ARF1 insert into the groove of the Sec7 domain, and that Lys73 of the switch II region of ARF1 forms an ion pair with Asp183 of ARNO-Sec7. 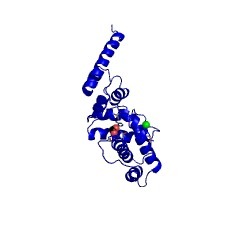 Solution structure of the cytohesin-1 (B2-1) Sec7 domain and its interaction with the GTPase ADP ribosylation factor 1. 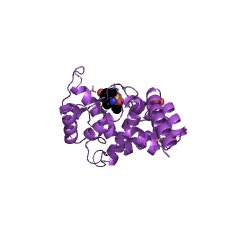 Cytohesin-1 (B2-1) is a guanine nucleotide exchange factor for human ADP ribosylation factor (Arf) GTPases, which are important for vesicular protein trafficking and coatamer assembly in the cell. 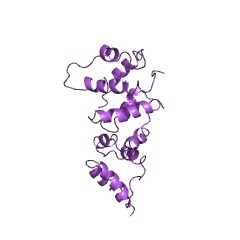 Cytohesin-1 also has been reported to promote cellular adhesion via binding to the beta2 integrin cytoplasmic domain. 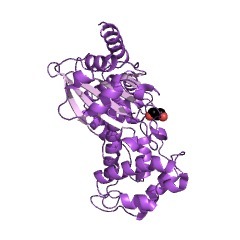 The solution structure of the Sec7 domain of cytohesin-1, which is responsible for both the protein's guanine nucleotide exchange factor function and beta2 integrin binding, was determined by NMR spectroscopy. 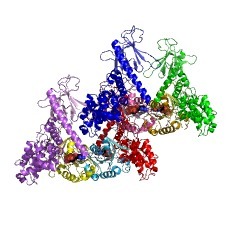 The structure consists of 10 alpha-helices that form a unique tertiary fold. 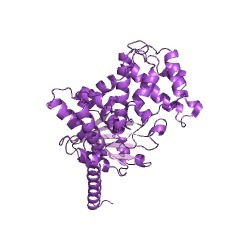 The binding between the Sec7 domain and a soluble, truncated version of human Arf-1 was investigated by examining 1H-15N and 1H-13C chemical shift changes between the native protein and the Sec7/Arf-1 complex. 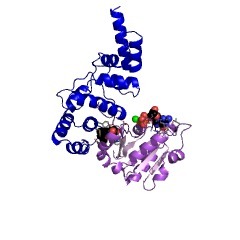 We show that the binding to Arf-1 occurs through a large surface on the C-terminal subdomain that is composed of both hydrophobic and polar residues. 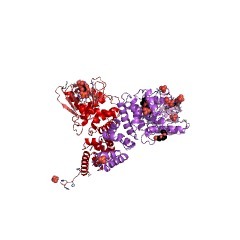 Structure-based mutational analysis of the cytohesin-1 Sec7 domain has been used to identify residues important for binding to Arf and for mediating nucleotide exchange. 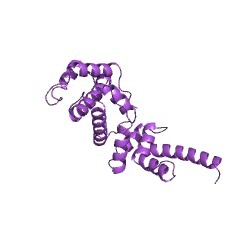 Investigations into the interaction between the Sec7 domain and the beta2 integrin cytoplasmic domain suggest that the two proteins do not interact in the solution phase. 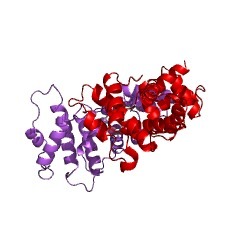 SEC7 encodes an unusual, high molecular weight protein required for membrane traffic from the yeast Golgi apparatus. Saccharomyces cerevisiae with mutations at the sec7 locus are pleiotropically deficient in protein transport within the Golgi apparatus and proliferate a large array of Golgi cisternae at a restrictive growth temperature (37 degrees C). 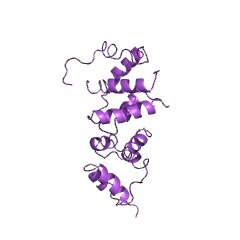 The SEC7 gene and its product (Sec7p) have been evaluated by molecular cloning and sequence analysis. Two genes that allow sec7 mutant cells to grow at 37 degrees C are represented in wild-type yeast DNA libraries. A single copy of the authentic SEC7 gene permits growth of mutant cells, whereas the other gene suppresses growth deficiency only when expressed from a multicopy plasmid. The SEC7 gene is contained on a 8.4-kilobase pair SphI restriction fragment, portions of which hybridize to a single 6-kilobase pair mRNA. The gene is essential for yeast vegetative growth. 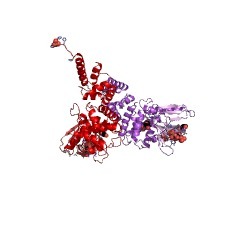 DNA sequence analysis of this region detects a single open reading frame with the potential to encode a 2008-amino acid-long hydrophilic protein of 230 kDa. Putative Sec7p contains an unusual, highly charged acidic domain of 125 amino acids with 29% glutamate, 18% aspartate, and 21% serine. Within this region, stretches of 14 consecutive glutamate residues and 13 consecutive glutamates/aspartates are predicted. This domain in Sec7p may serve a structural role to interact with lipids or proteins on the cytoplasmic surface of the Golgi apparatus.